J.G. Ballard vs Gu Long: FIGHT! On Friday at SpecTechnique we looked at Gu Long’s action writing and saw how he brought us into the POV of the spectators, forcing the reader to reconstruct Li Xun Huan’s impossibly fast dagger throw from the clues on the page. Today we’re going to look at a scene that does the exact opposite — the part in J.G. 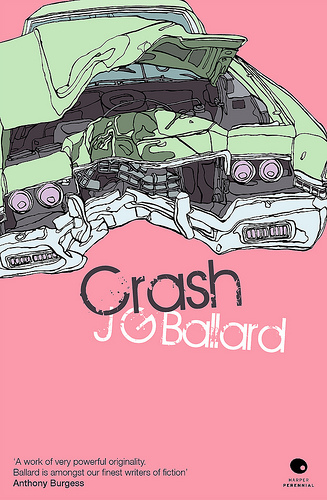 Ballard’s Crash where the POV character watches a slow-motion test film of an automobile colliding with a motorcycle. Whereas Gu Long omitted action, Ballard uses the slow-motion film as an excuse to lovingly describes more action than an unaided human eye could ever perceive. Beside the Ampex machine the visitors were watching the motorcycle as it crashed once again into the saloon car. Sections of the collision were replayed in slow motion. In a dream-like calm, the front wheel of the motorcycle struck the fender of the car. As the rim collapsed, the tyre sprung inwards upon itself to form a figure of eight. The tail of the machine rose into the air. The mannequin, Elvis, lifted himself from his seat, his ungainly body at last blessed by the grace of the slow-motion camera. Like the most brilliant of all stunt men, he stood on his pedals, legs and arms fully stretched. His head was raised with its chin forwards in a pose of almost aristocratic disdain. The rear wheel of the motorcycle lifted into the air behind him, and seemed about to strike him in the small of the back, but with great finesse the rider detached his feet from the pedals and inclined his floating body in a horizontal posture. His hands were still attached to the handlebars, now moving away from him as the cycle somersaulted. The metering coils severed one wrist, and he launched himself into a horizontal dive, head raised so that his face became a prow, bearing its painted wound areas towards the oncoming windshield. His chest struck the bonnet of the car, grazing its polished cellulose like a surfboard. Already, as the vehicle moved back under the impact of the first collision, the four occupants of the car were themselves moving towards the second collision. Their smooth faces pressed on into the advancing windshield as if eager to see the chest glider soaring up the bonnet of the car. Both the driver and his woman passenger rolled forwards to meet the windshield, touching it with the crowns of their lowered heads at the same moment as the motorcyclist’s profile struck the glass. A fountain of spraying crystal erupted around them, through which, as if in celebration, their figures were taking up ever more eccentric positions. The motorcyclist continued on his horizontal path through the emblazoned windshield, his face torn away by the centrally mounted driving mirror. His left arm detached itself at the elbow as it struck the windshield pillar, and was swept up through the fountain of glass to join the debris chasing the inverted body of the motorcycle three feet above his spine. His right arm moved through the fractured windshield, losing first its hand on the guillotine of the near-side windshield wiper, and then its forearm against the face of the front-seat woman passenger, taking with it her right cheekbone. The motorcyclist’s body slewed gracefully to one side in an elegant slalom, his hips striking the right-hand windshield pillar, buckling it at the central welding point. His legs rotated around the car, shin-bones striking the central door pillar. Above him, the inverted motorcycle fell on to the car’s roof. Its handlebars passed through the empty windshield and decapitated the front-seat passenger. The front wheel and chromium fork assembly plunged through the roof, the whiplashing drive chain severing the cyclist’s head as he swept past. The pieces of his disintegrating body rebounded off the rear wheel-housing of the car and passed over the ground in the haze of broken safety glass which fell like ice from the car, as if it had been defrosted after a long embalming. Meanwhile, the driver of the car had rebounded off the collapsing steering wheel and was sliding beneath the column into the lower compartment of the car. His decapitated wife, hands raised prettily in front of her neck, rolled against the instrument panel. Her detached head bounced off the vinyl seat covering and passed between the torsoes of the children in the rear seat. Brigitte, the smaller of the two children, lifted her face to the roof of the car and raised her hands in a polite gesture of alarm as her mother’s head struck the rear window and cannonaded around the car before exiting through the left-hand door. The car slowly came to rest, continuing to heave itself laboriously off the ground. The four passengers subsided into the glass-embroidered cabin space. Their signalling limbs, busy with an encyclopedia of unheeded semaphores, settled again into a crudely human posture. Around them, the fountain of frosted glass moved away for the last time. Rather than pick apart this scene for rhetoric, style, etc — I want to talk instead about a feature of the text you might not expect me to mention in a discussion about the style of action writing. And yet, in a passage this long, it’s the most noticeable feature of all. I’m talking about its word count. This excerpt lasts for 724 words, or about three typeset pages. According to Wikipedia, the average American adult reads prose at 250-300 words per minute. This means that it takes the average American reader two or three minutes just to read this car crash — a crash that, in “real time,” would take only two or three seconds. Therefore, we can estimate that the ratio between the time it takes us to read the scene, and the time the original crash would’ve taken to occur before the cameras slowed it down, is about 60:1. From now on, I’m going to refer to this ratio as the Time Ratio of an action scene. Just as everyone thought this sword would penetrate the youngster’s heart, Zhu Ge Lei suddenly give a loud yell, his sword left his hand, stuck on the ceiling. 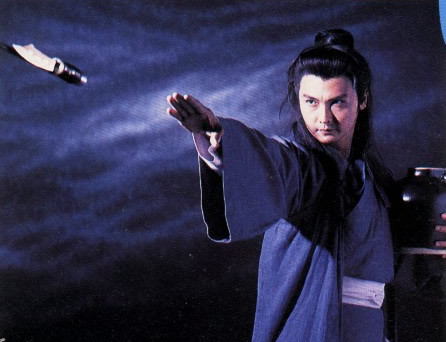 As the sword still springs back and forth on the ceiling, Zhu Ge Lei’s hands are already grabbing his own throat. But his eyes are on Li Xun Huan, the eyeballs almost popping out. Li Xun Huan at this moment is no longer carving. Because the dagger he used to carve the figure is no longer in his hand. Blood trickled from Zhu Ge Lei’s back. He stared at Li Xun Huan, his throat also giving off a ‘ge ge’ sound. It’s only at this time that people began to understand that Li Xun Huan’s carving dagger made its way to Zhu Ge Lei’s throat. Yet no one saw how this dagger got to his throat. This passage is just 144 words long. Assuming a 250-300 WPM reading speed, the average American will read it in about 30 seconds — probably less, since unlike the Ballard passage it has no figurative language or rhetorical devices. For the purposes of argument, let’s also say these events (thrown dagger, ZGL reacts, crowd finally gets it) take five seconds of “real time” to happen. This would mean that the Time Ratio of our Gu Long example is something like 6:1. 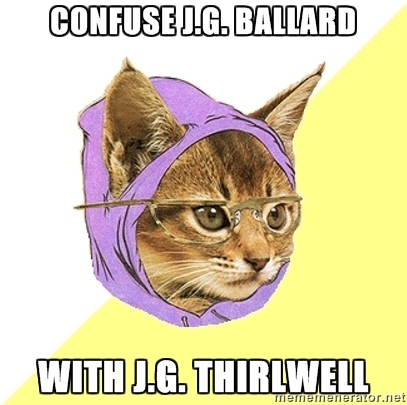 That’s about ten times faster than Ballard — but it’s still slower than reality. Nevertheless, because Gu Long omits the attack itself, the action still feels blazingly fast! A sequence written “naively” at 6:1 would probably feel a lot slower. I think that here, Gu Long is able to overcome a slow time ratio by the use of swift, cunning action devices. For three seconds, she smoked and stared into the darkness of space. For two seconds, she smoked and stared into the vastness of space. She spent less than a second staring into the blackness of space. Interestingly, whether two characters’ dialogue seems snappy or plodding, it’ll almost always be read faster than the characters could ever speak it! While the average reading speed is 250-300 WPM, conversational speech only happens at 150 WPM or so. As a result, its Time Ratio might be like 1:1.5 — or even 1:2, if characters are really hemming and hawing. However, descriptive passages and internal monologue can expand word count without appreciably extending the time it would take for the scene to “play out”. This would push the ratio closer to 1:1, the scene that (for a certain reader) reads precisely as fast as it happens. I intend to blog more about the “Time Ratio” in fiction because I think it’s cool, although obviously it can’t explain everything. The other stylistic devices of an action passage, such as Gu Long’s omitted attacks, still contribute heavily to the reader’s impression of speed. But I have a feeling that there are some wicked effects available to the writer who becomes conscious of this ratio and learns to manipulate it. See you next time on SpecTechnique, where we’ll be talking about how empty things in fiction aren’t really empty.